CLICK HERE to enroll in the 3/8 Workshop, Deadline: 3/1 --- Lee CTA needs to know how many to expect for lunch! 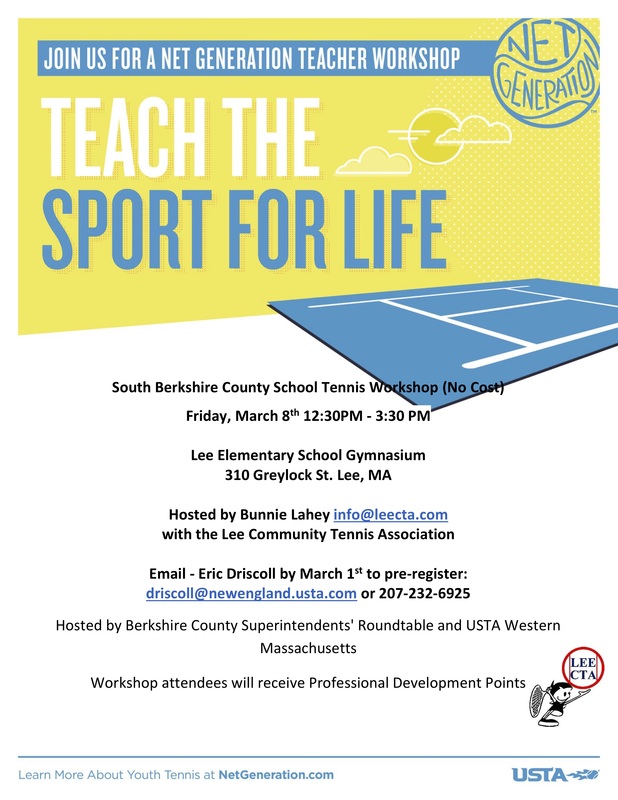 Be sure to email Eric Driscoll at driscoll@newengland.usta.com to pre-register for the workshop you choose! We (Lee CTA) have partnered with Lee Elementary School to bring Net Generation tennis into the gym! We are the first and only Berkshire County organization to seal this awesome partnership! The payoff: Our K-6 physical education teachers have received a very valuable equipment package and a curriculum that the kids are loving! We are planning a variety of after-school programs to introduce the kids to our beautiful courts. Please join us at this workshop to meet others who love the game and perhaps you'll find a role that you would enjoy in this endeavor. No tennis experience required! These programs will be affordable, inclusive and learn-rally-and-play focused. By the way, all the PE teachers in the county have received these flyers and have the option to attend on their professional development day. If you have a chance, give those teachers a little encouragement, so that your community doesn't miss out on this great opportunity! Invite them to join you at one of the workshops! Scroll to bottom of page for printable flyers for both workshops.